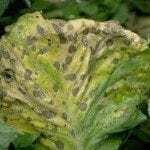 Alternaria leaf spot is a fungal disease that causes big problems for a variety of plants, including turnips and other members of the Brassica family. If left untreated, alternaria leaf spot of turnips can cause significant decrease in yield and loss of quality. Getting rid of alternaria leaf spot of turnip isn’t always possible, but you can take steps to keep the disease in check. Read on to learn more. 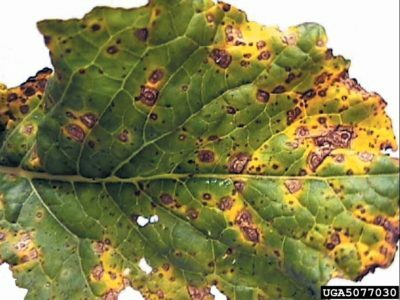 Alternaria leaf spot of turnip shows up on leaves first, displaying small, dark brown or black spots with a yellow halo and concentric, target-like rings. The lesions eventually develop a thick buildup of spores and the centers of the holes may fall out, leaving a shot-hole appearance. The spots also show up on stems and blooms. 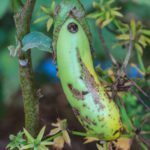 The infection is frequently introduced on infected seed, but once established, it can live in the soil for years. The spores are spread by splashing water, tools, wind, people and animals, mostly in warm, humid weather conditions. Plant turnips in well-drained soil and full sunlight. Apply fungicides at the first sign of disease, and then repeat every seven to 10 days throughout the growing season. Practice crop rotation. Avoid planting cruciferous crops such as cabbage, kale, broccoli or mustard in the infected area for at least two or three years. Keep weeds in check. Many, especially cruciferous weeds like mustard and queen anne’s lace, may harbor the disease. Destroy diseased plant parts by burning, or dispose of them in sealed plastic bags. Never compost infected plant debris. Plow the soil thoroughly immediately after harvest and again before planting in spring. Spray aphids with insecticidal soap spray; the pests may transmit disease. Avoid high-nitrogen fertilizer, as lush foliage is more susceptible to foliar diseases. Water at ground level using a soaker hose or drip system. Avoid overhead sprinklers.